My VIN number is has all the identifying marks of the original produced SA CJ5s. My VIN is the same on the VIN Tag in the glove box and the Paint and Trim plate in the engine compartment. 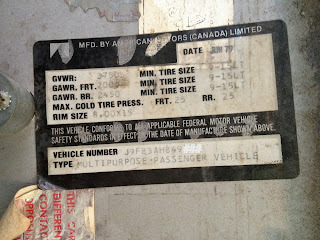 Digit 6: A for the Normal suspension (3750 lbs.). The other option was E for Heavy Duty (4150 lbs.). Digit 7 - H for the 304/2-barrel engine. Other options were A for 258/1-barrel, B for Inline 4/1-barrel, C for 258/2-barrel, and N for 360/2-barrel. Digits 8-13: 849XXX for the Production Number indicating the Brampton (Canada) Jeep plant (started at 800001). The other option was the Toledo Jeep factory (numbers 000001 through 799999). 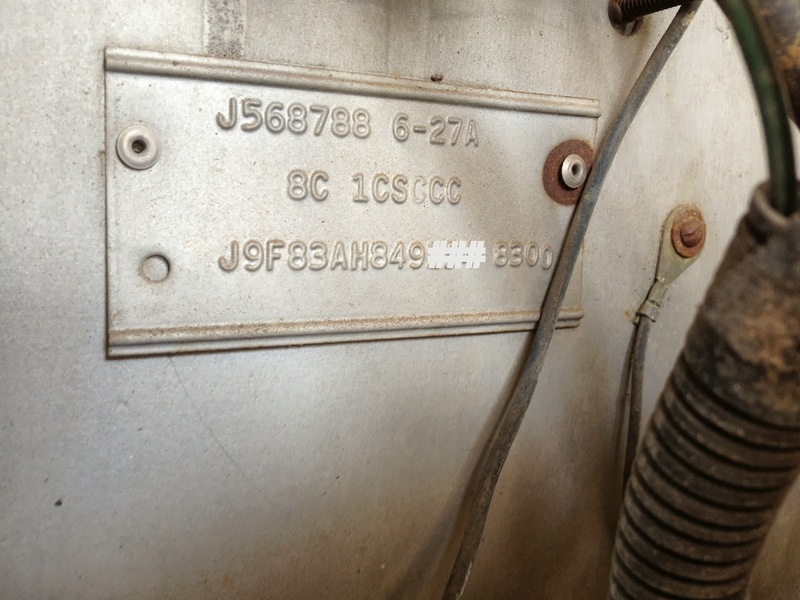 8C = this is the paint code for 1979 Silver Anniversary CJ-5s. 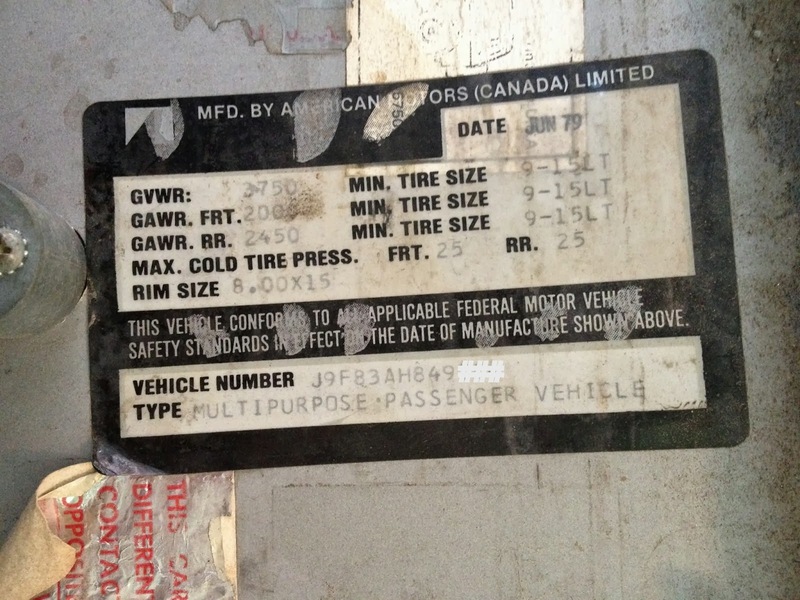 It represents Quicksilver Metallic, which according to some former employees was available at AMC’s Brampton (Ontario) Canada plant, and hence was one of the reasons all SAs were built at AMC Canada. It is believed that Quicksilver was leftover paint inventory at the plant from production several years prior. Note: this color is not listed in AMC/Jeep 1979 service and parts literature, although factor sales documents do mention this type of paint was used especially for SA edition CJ-5s. Second line has 1CS for the Trim Code for the SA CJ5. This is the Vinyl that is put on Jeep. I've got a (rather worn) glove box medallion. I've got the distinctive interior, but also rather worn. There are certain things in life that are worth passing down to your kids. Businesses, ethics, and coin collections obviously top the list. But, in my humble view, anniversary edition cars should be at the top of the list. This is a wonderful gift that my Dad passed down to me. A 1979 Silver Anniversary Jeep CJ5. My Dad owned this Jeep for 25 years; I believe he was the second owner. It's the vehicle that I learned how to drive on (back on some dusty country roads) when I was a kid. It's the vehicle that we took on family trips up to the Colorado mountains -- those of you who have been there already know the picture - passenger tires hanging half off the edge of the mountain side road with the wife screaming for her life staring down the drop-off. That was my family; with my brother and me sitting in the back encouraging my Dad to go faster! Well, my parents were talking about selling the Jeep, since it was just sitting in their driveway not getting any use, and I gently reminded them that I've always wanted it (Okay, Okay; I may have said "You can't sell it! "), and they agreed to let me take it off their hands. Well, this last week was the week where my Dad and I hauled it over to my house; and I start my Project. I call it my project because she needs some love and attention. My list starts off with the essentials so that I can drive it - registration & inspection. The registration will be the easy part. A prerequisite to getting her inspected would definitely be a running vehicle... Could be as simple as an old battery, or could be more complicated. We will see as time goes on. But I'm sure you'd like to see some pictures of what I have to work with. Here's the SA once it made it to my driveway. We were excited that the tires made it all the way over. These tires are about as far dry-rotted as you can get. They've been sitting flat for 2-3 years, and one of them had to get swapped with the spare - there was a hole in the sidewall from the crease. And here are some shots once she's in my garage. It was a lot harder to push it in the garage than we thought - the brakes kept locking up on us (probably from having the parking break on for 2-3 years), and we had to pull/push it with another car twice to get it moving again. If I'm not mistaken, this is probably the very first garage that this car has ever seen. There is some rust here and there, but all in all it's a pretty solid body. The windshield frame is completely rusted out on the inside - to the point that we were actually concerned that it might break and fall down on the ride over - but that's an easy replace.